Come and see what sailing is all about. Discover the fun of getting afloat and using the wind to move you across the water. Meet the friendly and helpful people who belong to our club and will help you share the fun they get. Etherow Country Park Sailing club is taking part in the RYA's Push the Boat Out incentive to introduce more people to our fantastic sport on Saturday May 18 from 10am - 4pm. There are slots available throughout the day. You can book now by using our contact us page. If you want to ask anything, please email enquiries@ecpsc.co.uk. You should wear garments that you don't mind getting wet (just a precaution), and bring a towel and change of clothes. You should have shoes that you can get wet plus a dry pair. We provide buoyancy aids and there will be safety boat cover on duty throughout the day. There will be a Sunday morning session on June 2 and we will continue the course on Sunday mornings after that. 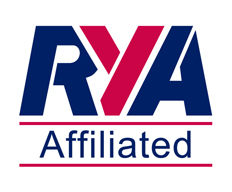 We follow the RYA Level 1 and Level 2 Syllabus. The accent is on practical sessions on the water with some land-based drills and a few short theory briefings. 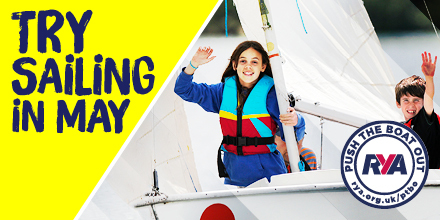 Anyone who fancies a return to sailing is also welcome at our Push The Boat Out day. If you want to go out on your own, that can be arranged, or you might try a double hander with someone who will be there to help you blow away the cobwebs. The protection of the personal data of our members and visitors is duty that Etherow Country Park Sailing Club accepts willingly. We do all we can to comply with the General Data Protection Regulation that was brought into effect in the spring of 2018. You can download our full policy by clicking on this link. Thank you for visiting the website of the Etherow Country Park Sailing Club, the only sailing club in Stockport. Feel free to browse our site and see what we have to offer. Etherow is a friendly club (when racing we experience good-natured rivalry!) and we welcome everyone: from those who may never have put their foot in a dinghy before, to Olympic team coach. Membership is inexpensive and we have some club boats that can be used, for a nominal charge, during the early stages. There are plenty of boats for sale within the club and elsewhere for very little money.